A recurring trend throughout the conference was that pure play commerce is no longer enough to sustain a retailer. Complementing a Bricks and Mortar with an e-commerce presence is a necessity for survival, and the opposite is trending to be true as well. Online-only retailers like, Warby Parker and Bonobos are prime examples of online only retailers that see the value in physical stores. It would seem that the consumer truly demands omni-channel retailing and retailers are scrambling to get the mix just right. What was once thought of as a threat, e-commerce has only strengthened purchasing power – when a consumer views a product on their mobile device while at a store, the probability of a store purchase actually increases. 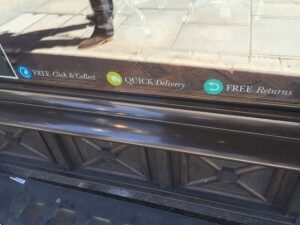 TREND: The emerging strength and success of Click & Collect stores have become conveniently-located distribution channels. 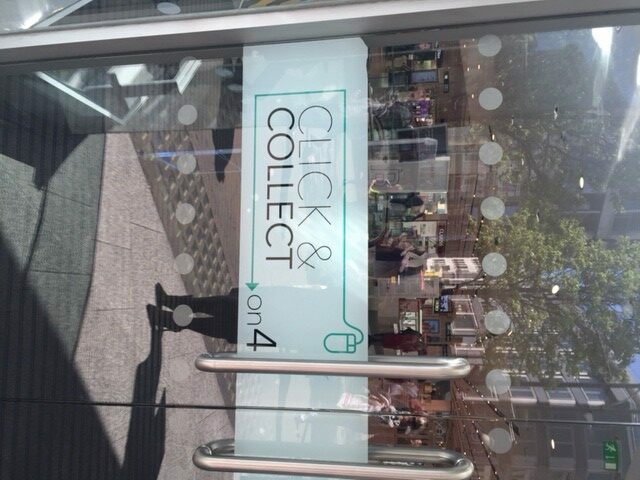 Throughout London, window decals prominently display messaging announcing that Click and Collect is available at their location.